The Staves have announced their return to Dublin for a gig in Whelan’s. The show is part of a mini tour of the UK & Ireland in support of “Blood I Bled”, their new EP which will be released on October 28th. Check out a photo gallery of The Saves’ latest Dublin gig in the Pepper Canister Church. 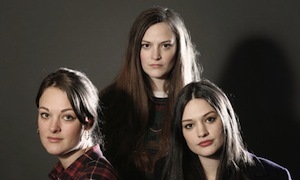 Tickets for The Staves at Whelan’s go on sale Friday, September 19th from Ticketmaster.